It’s that wonderful time of year, where family and friends gather for the holidays—both near and far. Attending the family gathering could mean traveling to another city or possibly out of the state. Because you are caring for a loved one with Alzheimer’s or another form of dementia, it doesn’t necessarily mean you can no longer travel together, or you must miss the festivities. Depending on the progress of their disease and mobility, you can still travel with your loved one with memory loss. It will just mean more careful planning before you leave. Before you start packing your bags, take a minute to assess your situation. Be realistic about what you can handle—both physically and mentally. Also, do you feel like your loved one is in a place to be able to manage travel and a family gathering? If you feel confident you can overcome the challenges, let’s plan a trip with these helpful tips! Do you need backup? Perhaps you are not strong enough to handle the luggage and your loved one. Considering asking a friend or family member if they would travel with you. Many hands make light work! They may also be instrumental as your emotional support. Disrupting their routine. The biggest challenge of traveling with a loved one with dementia is the disruption to their daily routine, which can be a source of comfort for them. Try to get your loved one back on schedule as soon as possible, especially bedtime. Plan your travel during the time of day that works best for your loved one. Try to adhere to their mealtime routine if possible. Wandering behavior. Often unfamiliar environments and extra stimulation can cause many to be confused and wander. Consider enrolling in MedicAlert + Safe Return. Look for companion care bathrooms so that you can assist them in the restroom. Have them wear an identification tag around their neck or an ID bracelet. Dress them in easy-to-find clothing, such as a bright yellow jacket or red sweater. Pack a door alarm or a childproof doorknob cover for wherever you stay. Avoid rooms with sliding doors with easy access to the outdoors. Do not leave the person unattended. Be prepared. To avoid the added stress of rushing, allow extra time for Pack well ahead of your trip and consider shipping your luggage to the hotel instead of carrying it with you. Bring with you a brief medical history that includes a list of current medications, known allergies, a list of doctors with contact information, and copies of any other important documentation such as insurance information or power of attorney. Make sure you have current family members’ contact phone numbers and emails in your phone. Bring favorite snacks, hand wipes for clean-up, comforting distractions like photos, books, and music to soothe, and water to keep them hydrated. Car trips. Limit the length you are in the car and take breaks as needed. If the person becomes agitated while you are driving, pull over and stop the car to tend to them. Don’t attempt to calm them while the car is moving; this is dangerous for you and them. Air travel. 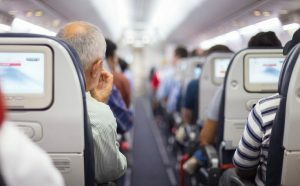 Take a direct flight if possible, making a connection could be a big challenge if they are overwhelmed. Even if they can walk, consider requesting a wheelchair so airport staff can help you maneuver the airport and minimize your wait in the security lines. Let the TSA agent at the security checkpoint know your loved one has dementia because they may be confused or find it difficult to follow directions. Follow behind your loved one through security, so you can better assist Book a window or middle seat for your loved one and you take the outside seat so they cannot wander. Pre-board the aircraft. Don’t be afraid to inform the flight crew of their special needs. Try noise-cancelling headphone to block out the distractions. Pack all medication in your carry-on luggage, so it does not get lost. Carry all boarding passes and important documentation for your loved one. Special arrangements. Consider booking your travel with a travel agency that specializes in travel for those with disabilities or special needs. They can assist you with setting up additional services and access to special lounges or quiet pray rooms at some airports to ease your travel. Set aside time for rest. Don’t underestimate the toll that traveling can take on you, especially when caring for someone else. Allow plenty of time for rest for both you and your loved one during your trip. Try to keep their bedtime consistent with home because fatigue can amplify their confusion and drain you. Remember to ask for help if you need it. From the airline crew to the hotel staff to your family members, many are willing to assist you on your journey. Sometimes, a trip may be too difficult or overwhelming for a caregiver to manage with an individual with Alzheimer’s or another form of dementia. If this is the case, consider a respite stay in an assisted living community. At Aegis Living, we take care of your loved one while you take a much-needed break to enjoy the holidays or a vacation. You loved one will experience the amenities, gourmet meals, activities, care services, and comforts of our community, while you can rest and relax knowing they are well taken care of.